When came the opportunity to cruise the River Lot for a few days on board a rented pleasure boat, I couldn’t resist the temptation of such a nice offer. The boat was based in Cahors, the Capital city of the Lot department. 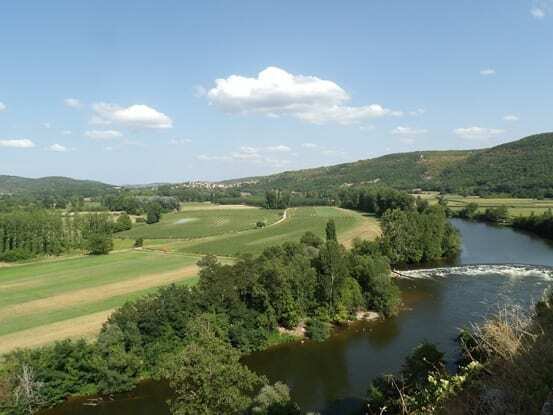 From Brive airport, an hour’s drive southward on the direct motorway got us to Cahors where our boat was quietly waiting for us. Travelling on your own boat means you have to take some food and drinks but most of you will probably do what we did and take most of your meals in some nice restaurants that you’ll meet as you potter along the river. Remember that when you are in France, shopping for food is not a great problem. Good fresh products are easy to find everywhere. 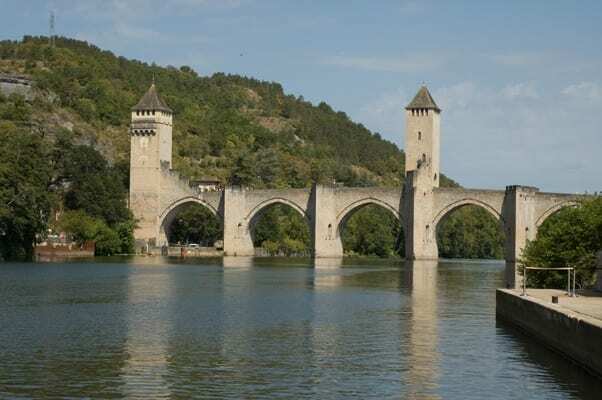 But Cahors is not only a town with a beautiful medieval centre, it’s the capital city of Cahors wine, the famous ‘Black Wine’ which has been written about for centuries. Before boarding, we stopped in the centre to take a look at the city and, of course, to collect some wine. For French people, wine is something very serious although pleasant. Before buying some bottles of Cahors, a little wine-tasting was suggested to us. So we stopped by the Villa Malbec on François Mitterand Square. There, next door to the tourism office, the Malbec Lounge offers visitors a few euros (say around £3) a wine-tasting of three types of Cahors wine chosen from amongst the dozens of bottles coming from various local wine estates. During about 20 minutes of rich explanations about Cahors wine, we learned that Malbec is the name of the grape variety and any Cahors wine contains from 70%-80% of Malbec for the ‘cuvées tradition’, to 100% of Malbec for the ‘cuvées prestige’. We left happy and euphoric along with our purchases! 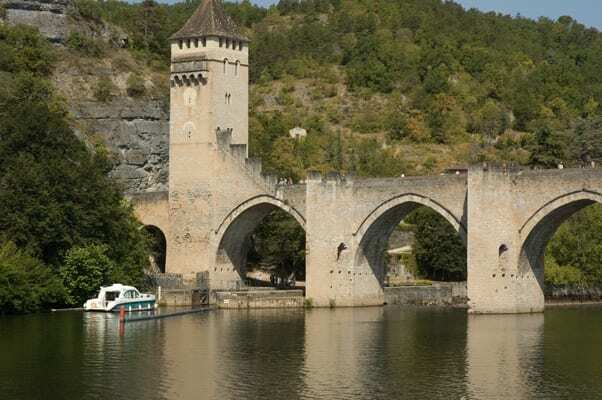 We have to get right at the foot of the stunning medieval Valentré Bridge protected since centuries by its three massive defence towers, to find our self-drive boat. It belonged to the cruise company Le Boat (www.leboat.co.uk). For a moment the relaxation of a river stroll was put aside as we listened to the boat handling demonstration. 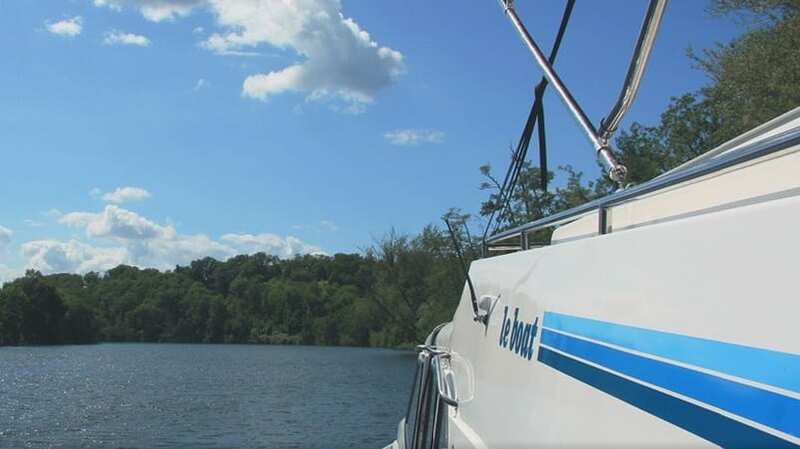 This covers not only the control of the boat but also the behaviour of the river and its meandering course, the engine, the navigation rules and how to work the manual locks on this part of the river. After a short test steering the boat, we cast off and took the helm to get to the first lock. One of the instructors stayed with us to help us through the first lock, where he left us. We had a lot of fun going up and down the iron ladders inside the lock and using our muscles to turn the strong crank arms. Oops! Now and for the next seven days we were sole masters on board. And for the next two hours everyone stayed on the deck, looking at the maps and guides, watching the flow of the current and taking turns at the helm. In comparison to the first, the second lock seemed easy and by the time we had navigated through the third we thought we were real sailors. To celebrate, we decided to open a bottle of Cahors to wash down a fresh baguette and a Rocamadour cheese, the famous creamy goat cheese produced in the village of same name in Northern Lot. As we cruised an unmistakeable feeling came over us: we were the kings of the river and we felt confident of our skills to properly appreciate the beauty of the landscape around us. Even a cold shower that wet us in a few minutes didn’t dampen our enthusiasm. We navigated with our raincoats until Lamagdeleine where we made landfall for the night. A two minutes walk got us to the small village where we had dinner at a local restaurant offering a simple but good cuisine for very affordable prices. At Le Rond Point, for 13,50€ that is less than 12£, you get a full menu including a glass of wine and a coffee. Back on board we opted for a last drink -obviously a little glass of Malbec- and then we felt asleep as soon as our heads hit the pillows. And so began our days on the river. Cruising at the foot of the fabulous cliffs that chart the river’s course we passed through so many locks, stopping almost everywhere to enjoy the landscape or to “sample” another restaurant and café. Testing the quality of regional specialities is part of a great journey, isn’t it? For breakfast we had a rule. The first one that woke up was in charge of getting fresh croissants and bread from the closest bakery. Don’t miss the bakery in Lamagdeleine, it’s a must. I wouldn’t like you to think that our journey was only about food and wine. They were cultural as well. We stopped by little villages on the banks of the river, some hardly known to visitors like Vers and some known worldwide like St Cirq-Lapopie <www.saint-cirqlapopie.com>. Since ancient times the Lot Valley has been occupied by men and they left us many traces. Before reaching St Cirq-Lapopie we cruised between two vertically high cliffs near Bouziès where a one kilometre long towpath has been dug into the cliff side. It’s now only open to pedestrians who really walk in a sort of a half-tunnel at the bottom of hundreds meters high cliffs. Quite impressive. 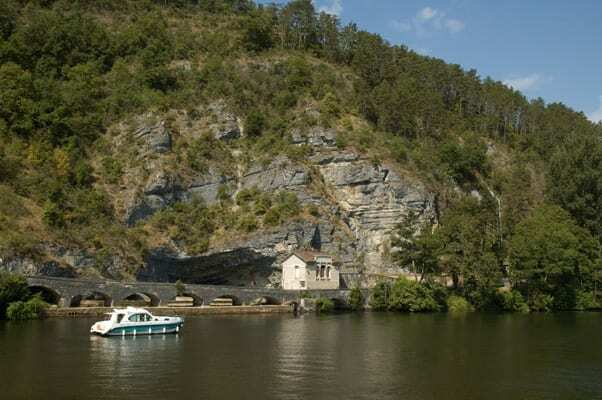 The cliffs that lined the river also hide some very little fortresses, called Chateaux des Anglais (English Castles) built halfway up like eagle nests. They go back to the Middle Ages when England and France fought for the possession of the duchy of Aquitaine. These stunning little fortresses are not easy to visit, and we didn’t even try. St Cirq-Lapopie, which a few years ago won an award as the preferred village of French people, needs a full day stop. Perched on the top of a hill overlooking a bend in the river, the narrow streets of the village are accessed by fortified doors. There is a maze of small houses dating from the 11th to the 16th century. Craftsmen and artists now work in some of the former small shops of the village. Nowadays they are indicated by a discrete, small, red flag. A matchless view over the valley awaits the visitors at the belvedere especially constructed to take advantage of the view. 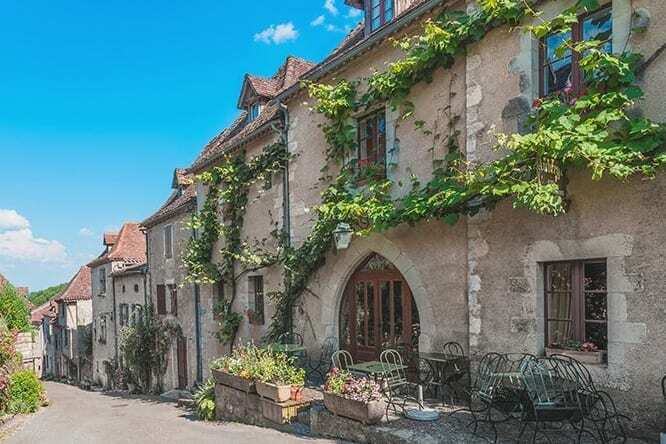 Once again, terraced restaurants were too inviting so we refreshed ourselves with a glass of wine – obviously Cahors wine – and the local cuisine including duck, lamb, foie gras and truffle. 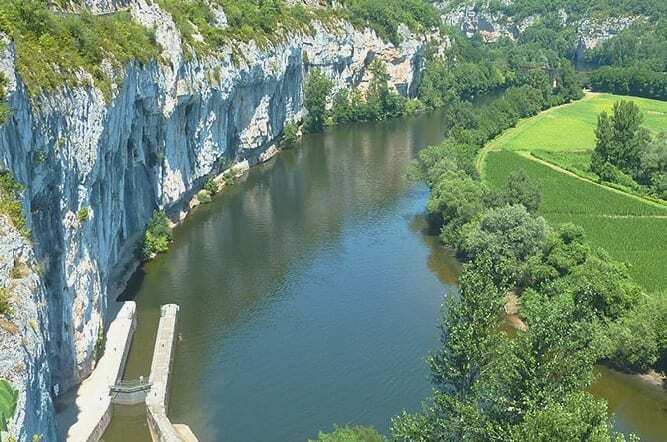 After a few more bends in the river, we reached Cénevières which has an extraordinary castle perched on the top of the cliff seventy metres above the river. 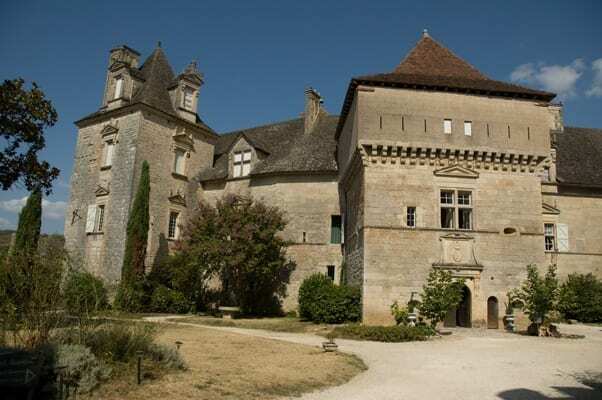 This private castle, owned by the Marquis de Braquilanges and his family, mixes a beautiful Renaissance building with a strong defensive system with walls, machicolations and covered ways. (A machicolation is a protruding battlement with an opening floor so defenders can drop things like boiling oil and boulders on attackers below). Guided by the owner himself, we walked through the castle from the elegant front of the house through its long, outside gallery and then into huge rooms with painted ceilings and full of historic souvenirs. Don’t miss the strange alchemy room and the little dungeon. The fascinating visit ended on the huge terrace where the view over the river and the valley let us imagine how great life could be in such a place. Cénevières was our furthest point on this cruise. It was time to turn back and our idyllically slow cruise continued downstream this time. We passed the same villages, but we chose to stop in new places. In Bouziès we landed for an eight kilometres excursion so that we would not miss the Pech Merle Cave www.pechmerle.com and the marvels of hundreds of Palaeolithic frescoes. 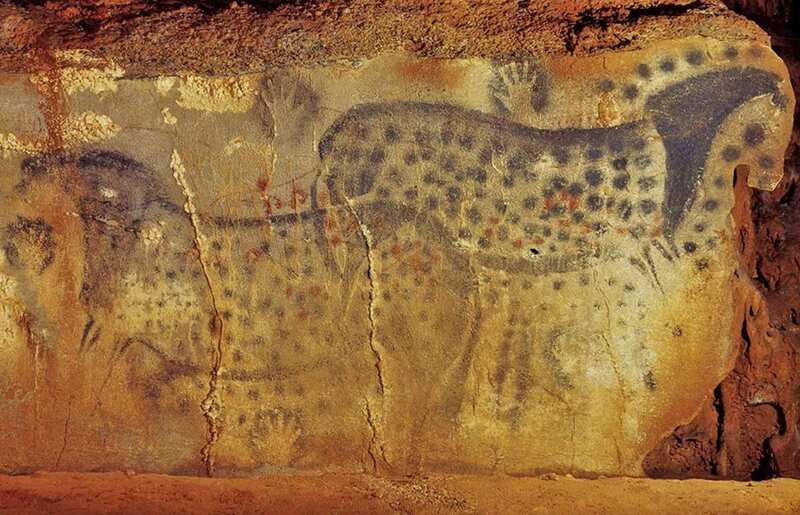 Famous for its coloured paintings of horses, mammoths and aurochs, Pech Merle is maybe the best preserved Palaeolithic cave older than 30.000 years. Before you start the tour there is a five-minutes presentation to allow visitors to appreciate the whole beauty of the show that awaits them twenty metres below. Finally our last day came and we arrived safe and sound in Cahors. We said goodbye to our boat and tried to find time to visit the old part of the town where stood the Saint-Etienne Cathedral with its two huge domes and its flamboyant cloisters. But we soon had to leave to get back to Brive airport knowing that we will come back soon or later to Cahors and the Lot.